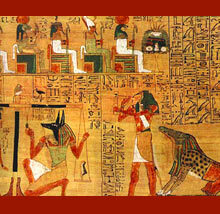 The Egyptian Book of the Dead is also known as the "Book of Coming Forth by Day" and "Book of the Hidden Dwelling". A philosophical study of this text reveals key insights into the Egyptian beliefs about the afterlife, but also about the inner life of the human being. By walking with the scribe Ani on his journey to the Otherworld, perhaps we can find something of value for our life today.